NO SET-UP OR SCREEN CHARGES, SIMPLY SUPPLY YOUR CREST OR LOGO. SEND LOGO TO NAVYBOSN1@COX.NET. NO MINIMUM ORDER. SAVE ON ORDERS OF TWO OR MORE. BECAUSE THESE ARE CUSTOM MANUFACTURED LOGO MATS AND RUGS, THEY ARE NON-RETURNABLE. APPROVAL OF PROOF REQUIRED PRIOR TO PRODUCTION. USUALLY SHIPS WITHIN 2-4 WEEKS OF APPROVING THE FINAL LAYOUT. PLEASE INCLUDE DESIRED SIZE AND WHETHER YOU WANT THE LOGO VERTICAL OR HORIZONTAL. PLEASE ORDER ONLINE OR CONTACT US FOR A QUOTE AT QUOTES@THEBOSNSLOCKER.COM. EXTERIOR VINYL LINK LOGO MAT - EMAIL US AT NAVYBOSN1@COX.NET OR CALL 619-474-2002 OR 2003 FOR A QUOTE. 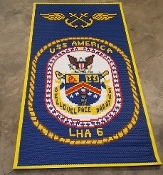 CUSTOM INTERIOR LOGO RUG NO SET-UP OR SCREEN CHARGES, SIMPLY SUPPLY YOUR CREST OR LOGO. SEND LOGO TO NAVYBOSN1@COX.NET . NO MINIMUM ORDER. DISCOUNTS ON ORDERS OF TWO OR MORE IDENTICAL RUGS. PLEASE CALL OR EMAIL FOR PRICING.